DEARBORN, Mich., Nov. 20, 2015 – Ford Motor Company has created a unique suit to dramatically teach young people about the dangers of driving under the influence of illegal drugs. Ford developed the suit together with scientists from the respected Meyer-Hentschel Institute in Germany to simulate some of the effects of drugs such as cannabis, cocaine, heroin, and MDMA (commonly known as Ecstasy); including slower reaction time, distorted vision, hand tremors and poor coordination. The new Drugged Driving Suit will be incorporated into Ford Driving Skills for Life, the award-winning young driver program that has provided training to more than 500,000 people around the world through hands-on and online tuition since its inception 11 years ago. Recent national data shows drugged driving on the rise. 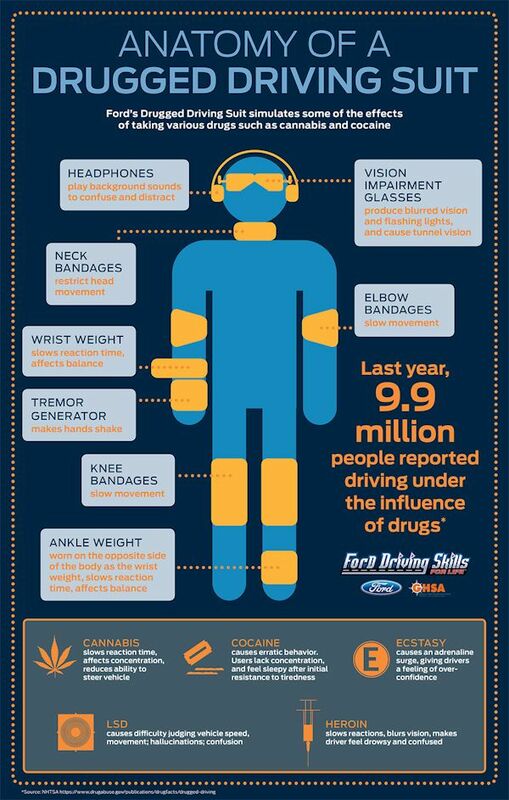 According to the most recent findings from the National Highway Traffic Safety Administration (NHTSA), approximately 18 percent of all motor vehicle driver deaths involve drugs other than alcohol, such as marijuana and cocaine. A NHTSA roadside survey also found that 22 percent of drivers tested positive for illegal, prescription or over-the-counter drugs. Like the Drunk Driving Suit that Ford incorporated into the Driving Skills for Life program last year, the new Drugged Driving suit simulates the effects of reduced mobility, vision and coordination with padding and ankle weights, goggles and headphones. According to the 2013 National Survey on Drug Use and Health, approximately 9.9 million people 12 and older reported driving under the influence of illicit drugs. Similarly, a meta-analysis of multiple studies from the National Institute of Health has shown that the risk of being involved in an accident roughly doubles after marijuana use. Ford Driving Skills for Life was established in 2003 by Ford Motor Company Fund, the Governors Highway Safety Association, and a panel of safety experts to teach newly licensed teens and parents the necessary skills for safe driving beyond what they learn in standard driver education programs. The basic premise behind Ford Driving Skills for Life is to provide a step in the learning process, providing new skills and information not currently shared with newly licensed drivers in basic driver education courses. By the end of 2015, the international program will be offered in 30 countries and a hands-on driving clinic conducted in all 50 states in the United States, Puerto Rico and the District of Columbia. The program is expected to have provided behind-the-wheel training to more than 150,000 drivers globally by the end of this year. Further details about the Ford DSFL program is available online at www.DrivingSkillsForLife.com, including training dates and venues, plus instructions about enrolling in the Ford DSFL Online training academy.